Vox Lux is a 2018 American musical drama film directed by Brady Corbet with a screenplay by Corbet from a story by Corbet and Mona Fastvold. It stars Natalie Portman, Jude Law, Raffey Cassidy, Stacy Martin and Jennifer Ehle. The film had its world premiere at the 75th Venice International Film Festival on September 4, 2018. It was released on December 7, 2018, by Neon. Teenage sisters Celeste (Raffey Cassidy) and Eleanor "Ellie" Montgomery (Stacy Martin) survive a school shooting in 1999, and are catapulted into stardom after writing and performing a song about their experience. The film traces Celeste's career as she draws the attention of a passionate manager (Jude Law) and rises to worldwide fame. In 2017, the now-31-year-old Celeste (Natalie Portman) is mother to a teenage daughter of her own (Cassidy) and is preparing for a massive concert while dealing with the media fallout of a terrorist attack using her own iconography. Principal photography began on February 1, 2018. Vox Lux premiered at the 75th Venice International Film Festival on September 4, 2018. It also screened at the 43rd Toronto International Film Festival on September 7, 2018. Shortly after, Neon acquired distribution rights to the film. It was screened at the 29th New Orleans Film Festival on October 23, 2018. It was scheduled to be released on December 7, 2018. On review aggregator Rotten Tomatoes, the film holds an approval rating of 60% “Fresh” based on 203 reviews, with an average rating of 6.39/10. The website's critical consensus reads, "Intriguing albeit flawed, Vox Lux probes the allures and pitfalls of modern celebrity with sharp intelligence and visual style, all held together by an assured Natalie Portman performance." On Metacritic, the film has a weighted average score of 68 out of 100, based on 35 reviews, indicating "generally favorable reviews". ^ "Vox Lux". Venice Biennale. Retrieved July 25, 2018. ^ "Vox Lux". Box Office Mojo. Retrieved April 21, 2019. ^ White, Peter (September 4, 2018). "Natalie Portman On Playing Pop Star Celeste In Brady Corbet's 'Vox Lux' – Venice". Deadline Hollywood. Retrieved September 4, 2018. ^ Donnelly, Matt (August 8, 2016). "Brady Corbet to Write and Direct Pop Star Drama 'Vox Lux' (Exclusive)". TheWrap. Retrieved February 1, 2018. ^ Kroll, Justin (September 21, 2016). "Rooney Mara to Play a Pop Star in Drama 'Vox Lux' With Original Music From Sia". Variety. Retrieved February 1, 2018. ^ Kroll, Justin (October 4, 2016). "Jude Law to Join Rooney Mara in Pop Star Drama 'Vox Lux' (EXCLUSIVE)". Variety. Retrieved February 1, 2018. ^ Tice Studman, Kristen (January 17, 2017). "Stacy Martin Has a "Very French" Approach to Drinking Wine and Eating Bread". W. Retrieved February 1, 2018. ^ Lang, Brent (January 26, 2018). "Natalie Portman Boards 'Vox Lux' (EXCLUSIVE)". Variety. Retrieved February 1, 2018. ^ Kroll, Justin (February 6, 2018). "Natalie Portman's 'Vox Lux' Adds 'Killing of a Sacred Deer's' Raffey Cassidy (EXCLUSIVE)". Variety. Retrieved February 6, 2018. ^ Barfield, Charles (August 21, 2018). "Sia & Scott Walker Providing The Music For Natalie Portman Musical Drama 'Vox Lux'". The Playlist. Retrieved August 23, 2018. ^ Willem Dafoe on Becoming Vincent  Van  Gogh: "You Want a Living Painting, Not a Museum Piece"
^ McAtree, Paige (January 31, 2018). "Movie Starring Natalie Portman, Jude Law To Film In Floral Park". New Hyde Park Patch. Retrieved February 1, 2018. ^ Vlessing, Etan (August 21, 2018). "Toronto: Natalie Portman's 'Vox Lux,' Chloe Grace Moretz's 'Greta' Join Festival Lineup". The Hollywood Reporter. Retrieved August 21, 2018. ^ "Vox Lux". Toronto International Film Festival. Retrieved August 21, 2018. ^ Fleming Jr, Mike (September 10, 2018). "Festival Action Heating As NEON Edging Towards Natalie Portman-Starrer 'Vox Lux:' Toronto". Deadline Hollywood. Retrieved September 10, 2018. 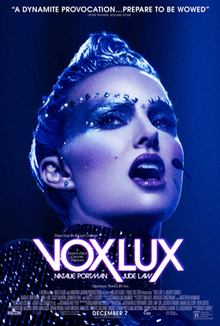 ^ "Vox Lux | New Orleans Film Society". New Orleans Film Society. Retrieved September 30, 2018. ^ D'Alessandro, Anthony (September 21, 2018). "'Vox Lux' To Strike A Chord This Awards Season As NEON Sets December Release For Natalie Portman-Jude Law Music Drama". Deadline Hollywood. Retrieved September 21, 2018. ^ "Vox Lux Reviews". Metacritic. Retrieved December 13, 2018.